Senior class misfits Tom and Dan want to participate in their school’s Battle of the Bands. Dan plays a mean bass, and Tom is a whiz on both guitar and keyboard—but two people, unfortunately, don’t a band make. They still need a drummer and at least one more guitarist if they want a chance at beating the competition. That's when Tom reaches out to Mark, a former friend and now star athlete, for his mad guitar skills. Later, they’re joined by exchange student Jacoby, who proves to be formidable on the drums. 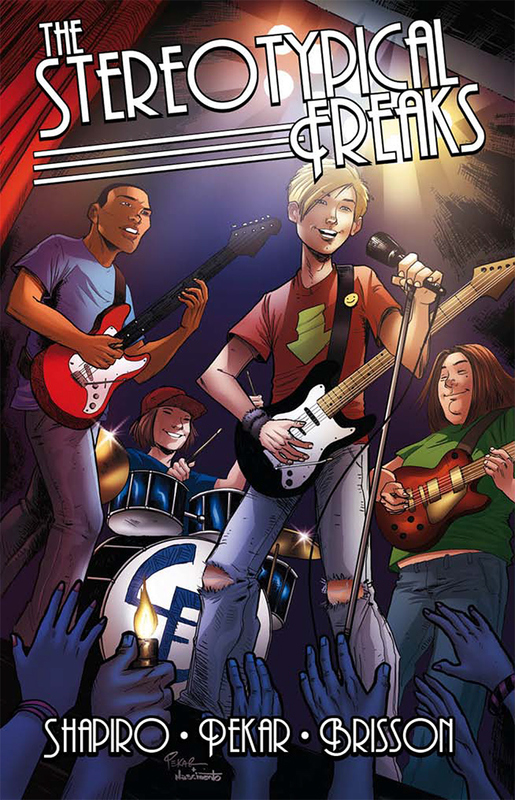 And so is born a new band, the “Stereotypical Freaks.” As the night of the competition draws close, the four boys revel in their awesome new sound—until one of them comes forward with a heartbreaking secret. Will misunderstanding and tragedy unmoor their new-found sense of comradery? Or will it bring them closer together? This is where, as a writer, I’m going to on my creativity high horse and point out that in a good story, readers should be able to pick up on themes by themselves. If a story requires direct intervention by the writer, then the story isn’t as strong as it could be. And unfortunately, I think that’s the case here. Recommended for older teens, ages 16-Up.